Halo 5: Guardians is the first time I haven’t loved a Halo game. Though, thankfully, the latest chapter in the sci-fi shooter universe has a few things going for it. Development studio 343’s second Halo game since taking on the mantle of responsibility from Bungie three years ago tries to tell the story of a hunt. In Halo 5, Master Chief goes AWOL chasing down a mysterious call that seemingly came from his AI ally Cortana. Since he and Blue Team apparently can’t properly communicate this to the UNSC, though, the military organization responds by sending Spartan Locke and the Osiris Team after him. You’ll switch between playing as the commanders of both teams, alongside three AI companions, in this storyline of chasing after a chase. You never really know much about what’s going on aside from this, except for vague references to the Mantle of Responsibility that was the basis of a lot of the lore that Halo 4 drew on. Oh, and there are giant Forerunner structures/weapons/technology known as Guardians popping up in dozens of colonies. As the distress calls from those colonies come in, and as you’re either chasing Cortana or Chief, you’ll run from planet to spaceship to planet on one giant, long race that ends unsatisfactorily. Halo was always about several gameplay staples that Bungie perfected into its Halo formula—the guns, the Covenant military structure, the big battles involving foot soldiers, tanks and Banshees—but 343’s gotta carve its own space while straddling that history. As such, the stories have taken a turn away from the actual Halo rings, pulled back into the core Halo lore of Forerunners versus Humans. In doing so, 343 introduced us to the Promethean enemies in 4, along with the utterly satisfying Promethean weaponry. In the last game they presented more of a love story between Chief and Cortana. Halo effectively became more character-driven. Cortana became more of a centerpiece; more than just a companion or love interest. 343 pushed her as a face of the series, like Master Chief. That fresh approach endeared me to Halo 4, 343’s first foray into an already storied franchise. But Halo 5’s campaign is a letdown in comparison to 4’s successful look into character development. In the place of a well-done storyline you have forced tension between Locke and Chief. You play most missions as Locke, and get some interesting insight into his team’s backstory in the form of casual dialogue as you run through Covenant and Promethean enemies on various planets and colonies. But the hunt itself never delivers on the narrative that Chief has potentially gone rogue, nor on the idea from the game’s commercials that he and Locke have some kind of issue. Midway through the game, there are a few choreographed scenes of a brawl between the two, and Locke cracks Chief’s helmet with his fist. It’s supposed to be an “oh no he didn’t” moment as Chief silently turns to face him, but it’s the only interaction between the two that portrays that tension. Without any substantial build in that narrative direction, the moment falls flat. If you enjoy going up against a mostly-Promethean enemy force, battling seemingly infinite numbers of scrambling dogs called Crawlers, Halo 5’s combat is great. You’ll weave in between tight corridors in spaceships or in between cover on the more open, large-scale maps. You’ll be dealing with enemies on the ground, enemies shooting from cover, aircrafts, turrets and snipers, as per usual. There’s not much in the way of innovation from what you’re used to in a Halo game—you’ll fight duos of Hunters, a variety of differently-skilled foot aliens like suicidal Grunts wielding plasma grenades or camouflaged Elites with one-hit-kill Energy Swords. There are some vehicular battles—mechs, banshees, warthogs—all of which are components that have always made Halo a solidly-designed game to play, but they’re few and far between, and nothing quite as exciting as the cutscenes make them out to be. All the jetting through space, slamming into spaceships and kicking enemies out of airlocks are only played out in short scenes. There’s effectively one boss throughout the whole game that you essentially, you guessed it, chase across levels. He regularly shows up trying to block your progress. He divides into copies of himself, and he’s got the age-old boss condition of mostly being vulnerable on his back. He seems like a zealot, which is fitting for a Halo enemy. The few Locke-Chief chase sequences end abruptly and without resolution. But I actually like where the Halo story is headed. I like that we’re getting at the root of the wars between races that led to one being mostly wiped out. I like that we’re starting to dissect some of the bigger issues in the Halo universe, beyond just the Flood that held the universe’s main players’ attentions in previous games for so long. The story that seems we’re eventually leading to could be an amazing one. It could reinvigorate the series in the same way the development of Chief and Cortana’s relationship did. We could be exploring the repercussions of the Spartan program and its use of children, which was pretty shady when you think about it. We could be playing through the state of the various technological advances that have both pushed humanity to its future and pulled them back into their past. Or maybe we just investigate more of that Mantle of Responsibility stuff everyone’s been mostly vague about so far. We’re not there yet. For better or worse, the best parts of Halo 5’s story are the spoilers at the end of the game. Of course, Halo 5’s campaign isn’t the worst. It’s a video game, after all, and it’s Halo. It’s the same Halo weapons and the same Halo vehicles and, hey, Nathan Fillion is back, too. (Remember ODST?) But Stephen put it best when he called the campaign mediocre. Fortunately, there’s also multiplayer, which is arguably the meat of any Halo game. There are some things you can’t really mess up with multiplayer. With a strong team, any of the Arena modes—Capture the Flag, Slayer, Stronghold, SWAT—are fast-paced and empowering, like most competitive shooters, especially if you happen to be skilled at them. Arena’s SWAT mode, a headshot-focused round with no motion trackers, is my favorite of the bunch and a fan favorite, too. I’d suggest that it’s the best mode to wrap your head around some of the new mechanics 343 has introduced for Halo 5. The mode boils the game down to its basics: having access to just one gun with unlimited ammunition, everyone has the same advantages and disadvantages. You’ll learn the map’s landscape more intimately, as you’re rapid-fire spawning after each death, hitting the ground running. As you zip around corridors, you’ll start to pick up on patterns of where players are most likely to show up and where they are most likely to camp out. In the place of a radar, you learn to judge the field by the flashes that indicate where your friends have recently died, giving you just the right amount of guidance as to where the fight is going down. The tighter maps are perfect for SWAT’s constant running and the leaping between platforms that you must do to flank enemies. SWAT, for those too afraid of change, feels like Halo at its purest, most core version of itself. As any competitive shooter fan will tell you, though, it’s the seemingly small stuff that makes a huge difference. In the place of the “flinch” mechanic three years ago, whereby your reticle will shift upwards after being shot, Halo 5 penalizes players instead with descoping. Halo 5 uses a smart-link system that lets players aim down the sights of any weapon, but if you’re hit, you’ll be knocked out of that view. This can be particularly frustrating for players who rely on sniper rifles or the DMR. On the other hand, you might feel it adds a new dynamic to the sniper-on-sniper duels you’ll often see on Halo maps. Ultimately, anything is better than bloom. Halo 5’s new Spartan moves will surely be less divisive than opinions on iron sights and descoping. Some of these moves are useful—you can easily clamber up to high ledges by jumping and grabbing onto them in one satisfying, fluid motion, or dodge in any direction for a quick evasion from fire. Others offer an added bit of strategy to your fight. Halo 5’s “ground pound” lets you slam down onto unsuspecting enemies from mid-air while the “Spartan charge” lets you tackle an enemy for a mostly-assured kill. The smart-link system lets you hover steadily in mid-air, too, letting you shoot at people from that vantage point. Ultimately, it’s Halo multiplayer, with a few variations, a shinier face and a few new moves. Then there’s the new mode, the 24-player Warzone that functions a little like a MOBA without as many confusing bits. The way to win each round is fairly simple: control bases until you expose the enemy’s core which you promptly destroy, or hit 1000 victory points before the opposing team does. There’s another system at play, based on a match-to-match leveling system, that will define how each match plays, and it involves a few more rules. You’ll start each match fresh, at requisition rank 1. The more enemies you kill (including farming AI enemies), the more bases you capture, and the more targeted AI bosses you hunt, the more your requisition level will go up. By unlocking those requisition ranks, you unlock the ability to use cards of a corresponding rank number. Those cards represent some kind of drop—weapons, vehicles, armor boosts—that you automatically equip at your next spawn. Obviously, the higher-tiered weapons and vehicles matching the higher-tiered requisition rank are your goal. Completing matches and earning commendations gets you access to requisition packs full of cards of all kinds. You get them by playing, but you can just buy a requisition pack, too, either with requisition points you earned through playing and selling back unwanted cards or with real money. So, yes, technically, Halo 5 has microtransactions. The developers are clearly trying to ensure balance and to avoid giving players a chance to pay to win. They do this in two ways: 1) each deck that you buy is randomized, and 2) if you’ve played one of your better cards during a Warzone match, you have to wait for an energy bar to fill back up before you can play another big one. So you can’t, for instance, specifically buy 20 tanks and ruin the curve for everyone else. For all you know, half of what you’ll get in a purchased pack are a bunch of useless mongooses. And even if you have loaded up on the best cards through multiple rounds of purchasing, you’ll still have that energy meter controlling how often you can call those cards in. You might be able to grab a speed boost pretty frequently, for instance, but those tanks will take a bit more energy before you can use them again because of their higher-level tier. It’s too early to tell just how solid a plan to avoid that pay to win scenario this is, but the simple act of ranking up within each match in order to secure a trusty battle rifle or claim a Banshee card is half the fun of Warzone. The requisition system gives all levels of players a fighting chance, even if they might not be as quick to pick up a fuel rod cannon or as good at staying alive while using one. If you’re having a particularly great round, you’ll feel the immediate reward of your success in the form of your requisition rank and your subsequent access to higher-tiered weapons and vehicles. It also adds an extra layer of strategy. Calling in a scorpion tank too early in the fight, for example, and thereby sacrificing a rarer card might be the bad call that cost you an advantage later in the match. Warzone is still a shooty, team effort, but that’s not all that it requires for you to secure a win. Making smart decisions about how and when to use your cards could make a big difference in how a match plays out. If you’re still not enjoying yourself against especially talented shooter players, hunting down AI bosses with a few friends can be equally gratifying. (Unless the other team decides to take on that same enemy and then, well, hey, you are playing a competitive multiplayer shooter mode, after all.) Warzone feels like it’s accessible to players of all kinds of skill levels, in a genuine way and not just as a marketing line. Warzone is new to Halo, and it might feel unfamiliar enough to longstanding fans that it becomes a turnoff. But with standard offerings provided under Arena, I found 343’s new mode compelling and fresh. Gone are the days of racing to the locations where everyone knows the best weapons spawn. Well, mostly. Some Arena matches will have timed drops of snipers and other prized weapons in specific spots on the map. The challenge in 343’s new vision of Halo multiplayer in Warzone falls on your ability to perform and to manage your deck of cards wisely. 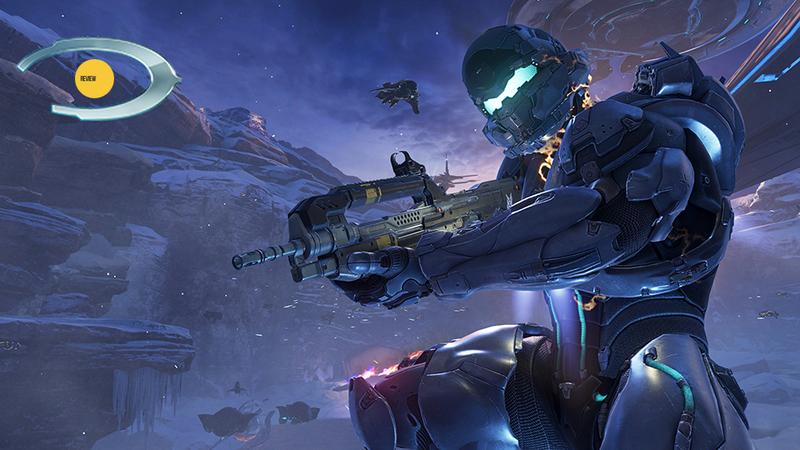 Halo 5 isn’t quite the whole package that Halo fans are used to. The campaign never sells its narrative of a big, tense chase. Instead it’s a drawn-out, forced experience that stops short before it has a chance to get interesting. Multiplayer, for whatever that’s worth to you, is Halo 5’s saving grace. Tina Amini is that girl who used to work at Kotaku, now freelancing for Kotaku, whose next project is still in stealth mode. Say hi on Twitter.